Question 1. Why are some substances biodegradable and some non-biodegradable? Answer. Some substances can be acted upon by the micro organisms and broken down into simple substances. Such substances are called biodegradable. Some substances are inert and cannot be acted upon by the microorganisms and do not breakdown into simple substances. Such substances are called non- biodegradable. Question 2. Give any two ways in which biodegradable substances would affect the environment. These substances are decomposed by the action of microorganisms. This causes fowl smell. During the process of decaying of biodegradable substances, various types of gases are released which cause air pollution. They persist in the environment for a long time and thus damage the environment. Such substances cause land pollution and water pollution. Question 1. What are trophic levels? Give an example of a food chain and state the different trophic levels in it. Answer. There are various series of organisms feeding on one another. These series of organisms taking part in various biotic levels form food chain. 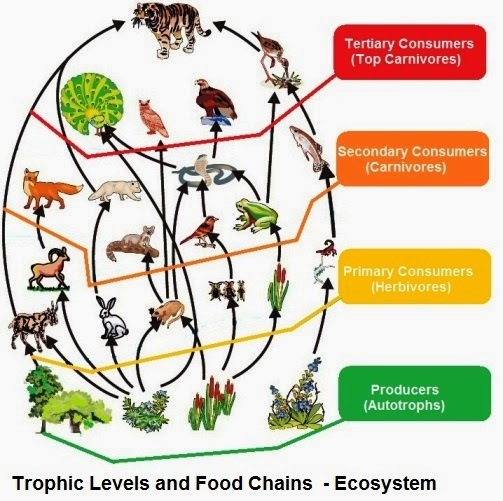 The steps or levels of the food chain are called trophic levels. An example of food chain: Grass-->Deer-->Lion. The grass , which is autotroph or the producer, comes at the first trophic level . It fix up the solar energy and make it available for deer as primary consumer. Lion, which is Top Carnivore, comes at Fourth trophic level. It consumes dear at second trophic level ( or others at third trophic level). Question 2. What is the role of decomposers in the ecosystem?. Answer. Decomposers are called natural cleaning agent. They act on biodegradable substances and break them into simple substances. In this way, decomposers create a balance in the environment and play an important role in ecosystem. Question 1. What is ozone and how does it affect any ecosystem? Answer. Ozone is a molecule formed by three atoms of oxygen. Ozone is formed by the reaction of three molecules of oxygen is presence of ultraviolet (UV) rays. Ozone performs an essential function. It shields the surface of the earth from ultraviolet radiation of the sun If this radiation enters in the atmosphere, it could cause various disorders. So, ozone protects the ecosystem from damaging. Question 2. How can you help in reducing the problem of waste disposal? Give any two methods. There are two types of wastes; biodegradable and non-biodegradable. We should consume more and more substances that generate biodegradable wastes. Biodegradable wastes so generated, should be sent to solid waste management plants where it may be used either for compost production or making fuel bricks. Non-biodegradable waste should be segregated and then be sent to factories for recycling of products. Question 1. Which of the following groups contain only biodegradable items? Answer. (c) Fruit-peels, cake and lime-juice (d) Cake, wood and grass. Question 2. Which of the following constitute a food-chain? Answer. (b) Grass, goat and human. Question 3. Which of the following are environment-friendly practices? Question 4. What will happen if we kill all the organisms in one trophic level? Answer. Each and every trophic level depends for its energy needs on its previous trophic level. 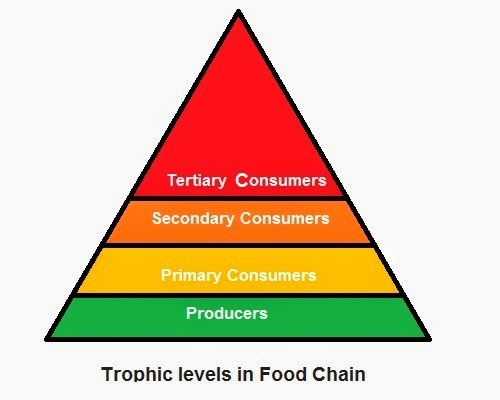 If all organisms of any of the trophic levels in a food chain are damaged, the organisms of other trophic levels will also be destroyed because energy flow is stopped from one trophic level to other trophic level. Question 5. Will the impact of removing all the organisms in a trophic level be different for different trophic levels? Can the organisms of any trophic level be removed without causing any damage to the ecosystem? Answer. No, the impact of removing all the organisms in a trophic level is same for different trophic levels. The removal of organisms of any trophic level is damaging and it causes various disorder in ecosystem. Question 6. What is biological magnification? Will the levels of this magnification be different at different levels of the ecosystem? Answer. When any harmful chemical like DDT enters in a food chain, its concen-tration increases gradually at each trophic level. This phenomenon is called biological magnification. The levels of this magnification will be different at different levels of the ecosystem. Question 7. What are the problems caused by the non-biodegradable wastes that we generate? Answer. The non-biodegradable wastes persist in the environment for a long time and causes various problems. Water pollution so that water becomes unfit for drinking. They cause land pollution and due to it land loses it beauty. They cause stoppage of flow of water in drains. They also cause air pollution and make the air poisonous. Question 8. If all the waste we generate is biodegradable, will this have no impact on the environment? Answer. The biodegradable wastes do not persist for a long time in the environment. However, they also cause harmful affects but these effects are only for sometime.These wastes can be converted into useful substances and broken into simple substances by the action of microorganism. So, there will be impact of biodegradable waste but for a short time. Question 9. Why is damage to the ozone layer a cause for concern? What steps are being taken to limit this damage? Answer. Enlargement of ozone hole will cause more ultraviolet rays to reach on the earth's surface. This is very harmful for us, animals and microorganisms in the following ways. Ultraviolet radiation may cause skin disease, especially skin cancer. plant life will be disturbed due to retarded growth and destruction of pigments. UV rays may kill microorganism, decomposers and other useful microbes. It may lead to ecological imbalance. Judicious use of aerosol spray propellants such as fluorocarbon and chlorofluorocarbons which cause depletion or hole in ozone layer. Limited use of supersonic plains. Control over large scale nuclear explosions. The various components of an ecosystem are interdependent. Each step or level of the food chain forms a trophic level. The producers make the energy from sunlight available to the rest of the ecosystem. The autotrophs or the producers are at the first trophic level. They fix up the solar energy and make it available for heterotrophs or the consumers. The herbivores or the primary consumers come at the second, small carnivores or the secondary consumers at the third and larger carnivores or the tertiary consumers form the fourth trophic level. There is a loss of energy as we go from one trophic level to the next, this limits the number of trophic levels in a food-chain. There are generally a greater number of individuals at the lower trophic levels of an ecosystem, the greatest number is of the producers. Human activities have an impact on the environment. The use of chemicals like CFCs has endangered the ozone layer. Since the ozone layer protects against the ultraviolet radiation from the Sun, this could damage the environment. The waste we generate may be biodegradable or non-biodegradable. The disposal of the waste we generate is causing serious environmental problems. 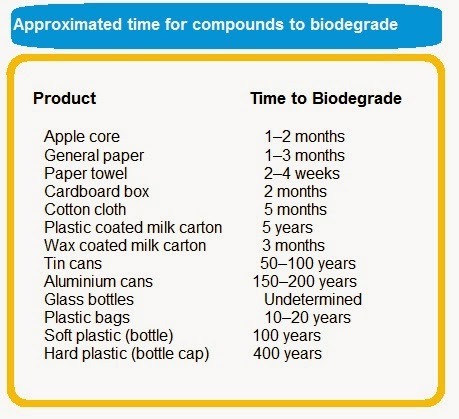 Different compounds takes different time to biodegrade in a marine environment.